San Francisco posted America’s largest five-year income gain for middle-class households, with earnings up by more than 30 percent. Of the 20 U.S. cities with the fastest-rising incomes, Fremont workers earn the largest annual salaries: more than $122,000. Over the past two decades, the number of Oakland households who take home between $75,000 and $100,000 has nearly doubled. The first couple of months of 2019 have brought promising news to Bay Area home shoppers, with buyers gaining more leverage and mortgage rates falling to the lowest point in a year. And though the region’s housing prices remain the highest in the country, households in the Bay Area have enjoyed the country’s largest income growth. That’s according to an analysis by GOBankingRates, which crunched income-growth numbers for 200 large cities to find out where middle-class Americans are seeing their paychecks rise the fastest. The study uses Pew Research’s broad definition of the middle class, defined as households who earn two-thirds to double the nationwide median income, while the top 20 cities are ranked using five different measures of earnings growth as measured by the U.S. Census Bureau. 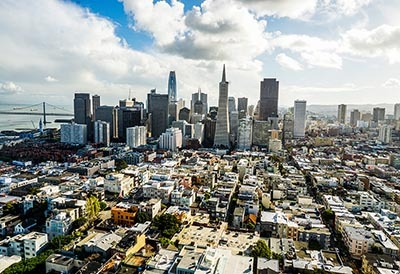 By those criteria, San Francisco households have seen the nation’s biggest improvement in their finances, with the five-year median annual income up by 30.4 percent, from $73,802 to $96,265. The city’s wage growth has been propelled by substantial job additions in the information, professional, scientific, and management-services sectors, which created nearly 37,000 new positions during that period. San Francisco serves as a prime example of how broad the middle-class categorization is, with incomes ranging from $64,177 to $192,530. Across the bay in Oakland, five-year incomes have increased by 22.4 percent to $63,251. Over the past 20 years, the number of Oakland households who earn between $75,000 and $100,000 has nearly doubled. Another Alameda County city — Fremont — ranks No. 3 for middle-class income growth, up by 23.2 percent over the past five years. Fremont households pull down the largest incomes of any city included on the list: $122,191 per year. Two other California cities make the cut for middle-class income growth: No. 6 San Jose and No. 8 Sunnyvale. Both cities’ economies are heavily dependent on the high-paying tech sector, which helped drive five-year incomes up by 18.8 percent in San Jose to $96,662 and up by 22.1 percent in Sunnyvale to $118,314. It’s the second time this month that Bay Area professionals have been noted for their earning powers. Two weeks ago, Bloomberg’s annual list of America’s wealthiest places named Atherton as the country’s most affluent community, with an annual household income of more than $450,000. Other Bay Area communities that rank among the country’s 50 richest can be found in San Mateo, Santa Clara, Marin, Contra Costa, and Alameda counties.